Revoice Pro has a display in the session window's right hand border which shows what is currently editable in the tracks related to a selected Process or waveform. 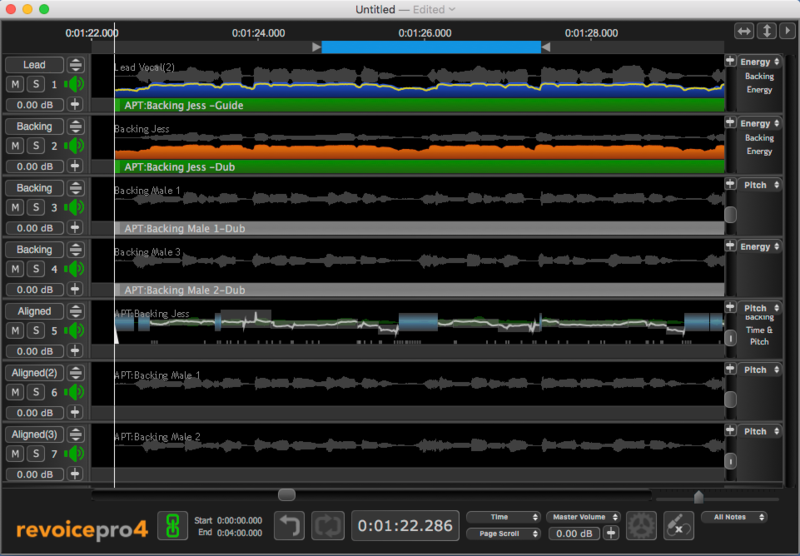 This is particularly useful as more tracks get added to a session, as in the image below. The selected Guide and Dub Process Input blocks for (APT:Backing Jess) are shown in light green and the Output of APT:Backing Jess is shown in darker green in the image above. But the selected process' information is also displayed in the Selected Item Display at the right of the image which identifies the selected tracks and editable items in the selected process. Even if the selected process scrolls horizontally out of the main window's time view, the item shown in this special area remain displayed. The drop down menus in this display can be used to make items editable and the display scalable. If we then click on the Process Control Blocks for APT:Backing Male 1 or its output, then the Selected Item Display will switch to show that process's details on the appropriate tracks.